12 tracks: Giant * Broom O’ The Cowdenknowes / Tha Mi Tinn * Aviemore / Ca’ The Stirks Frae Oot The Corn / The Drummer / The Argyle Bowling Green * Hall Of Mirrors * Lullabye For A Very New Baby * Memories Of Father Angus MacDonnell * The Duke Of Gordon’s Birthday / The London Lasses / Da Eye Wifie / The Fyrish Reel * The Piper And The Maker * Eventide * Basker’s Delight / Mrs McGhee / The Black Hoe * The Auld Refrain * John Anderson, My Jo. Traditional Scottish and Cape Breton tunes are skilfully blended with some of The Cast’s original songs. 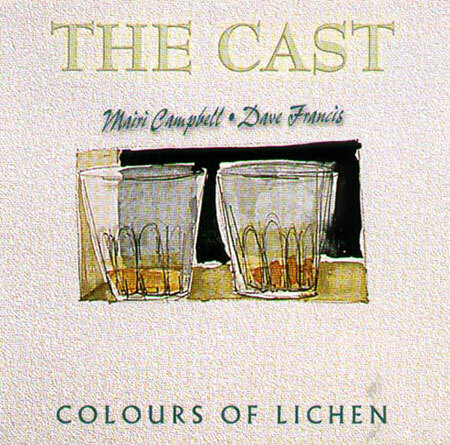 Mairi Campbell (voice, viola, fiddle) and Dave Francis (guitar, voice).